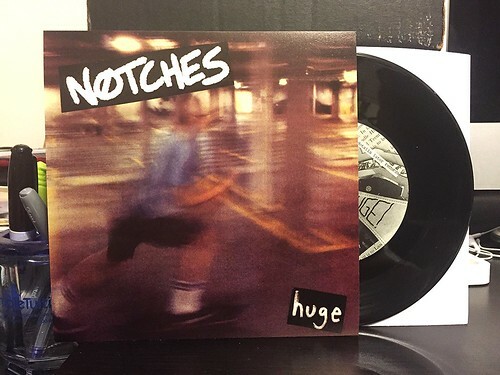 I Buy Way Too Many Records Dot Com: Notches - Huge 7"
Young Modern sent me this Notches 7" to review along with the band's recent full length (that review will be coming soon). This was another in a series of bands I didn't know about that knocked my socks off when I gave them a whirl. We'll start with the one criticism I have first and that's that the recording quality isn't quite up to how great the songs are. Don't get me wrong, I'm not a fan of slick, overproduced sounding rock & roll and I appreciate a little hiss and grime in a recording. Unfortunately for the songs on this 7" the recording makes things, particularly the vocals, seem a little flat. The good news is that these four songs are all so good, they cut through any production issues. I can't speak for the band and say what their influences are, but they certainly seem to be taking cues from some bands from the 90's that I enjoy. Superchunk is the easiest comparison to make, but to me I really hear elements of bands like Buford or Corduroy. For a modern comparison, they make me feel the same way that bands like Hooper and Rumspringer do and that's some pretty great company. It's a great introduction to the band especially as a primer for the full length. I'll be reviewing it shortly, but as a spoiler I have no qualms at all with the recording quality on that one.